It could be craft paper from a craft/hobby shop, or it could be rescaled doll house wall paper. I can't keep track any more. I have a bunch bought/printed and stashed. Wow, there's a lot of good looking stuff on that site, thanks! I here ya on the keeping track part ... lol. Colin is aces. His stuff is brilliant, the kits go together beautifully, and his supportive and helpful. I highly recommend his stuff. I have most of the Western Europe stuff, and want everything I don't have. Thinking on that wallpaper, I think that stuff might be from hobby lobby. In the scrap booking area, Games Poet. So far I am at a unit of 10 bloodletters, a unit of 10 warhounds, a chaos chariot, and three chaos warriors, hoping to boost that up to a unit of 12 after work tonight. Debating painting Archaon as well. I'll do up goals for March soon. You tease, GP. Stringing us all along like that! On a serious note, though ... you ok? I've had a rough last couple of weeks, and will what I can do to update later today. Another bunch done. 11 more warriors, Lord on Daemonic Steed, Archaon (6th), and 16 marauders. Sorry folks. I made a last minute choice towards the end of the day to go see "They Shall Not Grow Old" before it left the theaters. That means I'll take some time later today instead, to update for March. Thanks for your patience! Finished my primary unit for March. 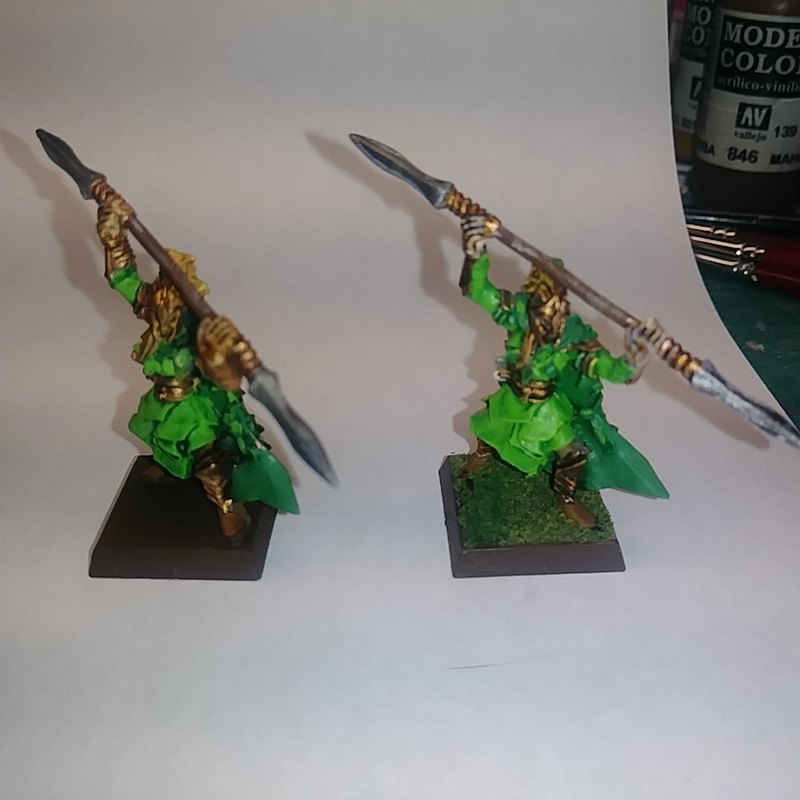 x15 Wood Elf Eternal Guard with command. The rick was matching these to ten others i painted more than 4 years ago. The last pick is a comparison shot. What do you think? They look "green"! Time for them to see some table top action! Genestealer cult figure now completed. Micro Art Studio figures are over scale and not usable. GP ... finish small MDF building, (#?) Late Perisan Cavalry. While wondering how to paint my Ancient Evil model, I'm working on a unit of 10 heavily armoured Orcs, let's call them chieftains. I'm downsizing and my march goal is current just 3 stormcast. I'm going to get them finished this time! I wasn't able to finish my Februari goals, but I hope to finish them for March. No need for apology here, its understandable, stuff happens. 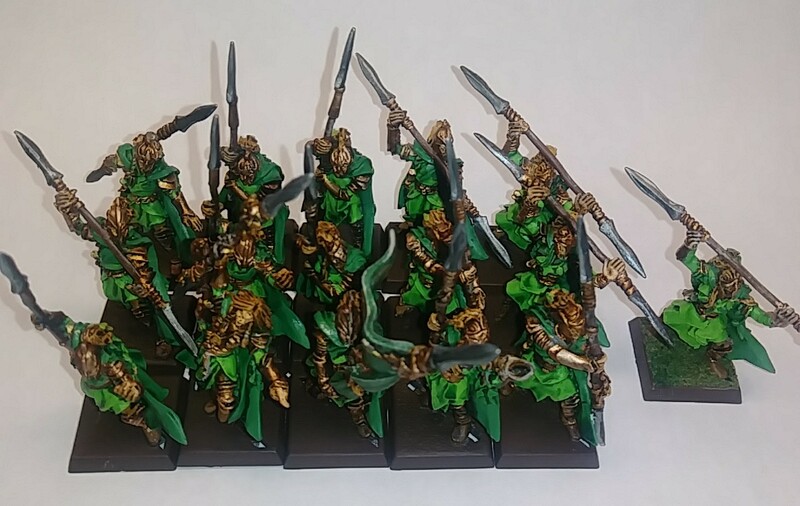 Bar the bases, 20 Sartosans done. Padre is being a bit impatient today. How's that for a bold medal? Love those Sartosans, suitably motley and disreputable! 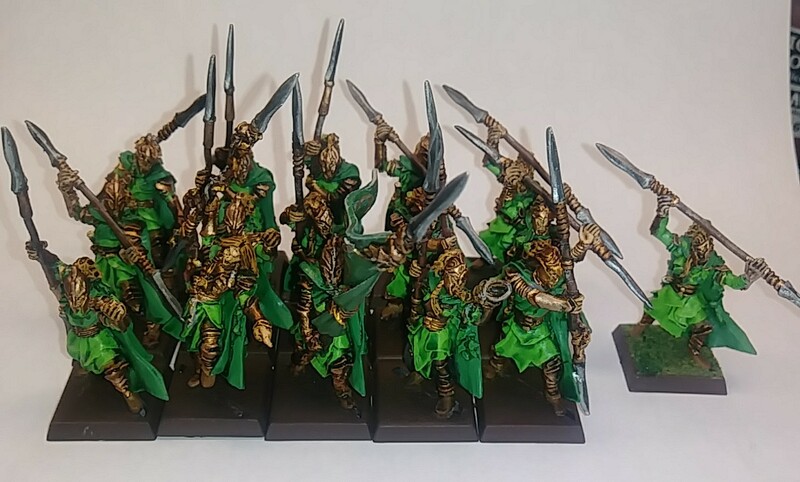 Finished those 10 armoured orc "Chieftains"
Not great pictures, I just can't get the lighting / colour balance to be consistent at the moment. 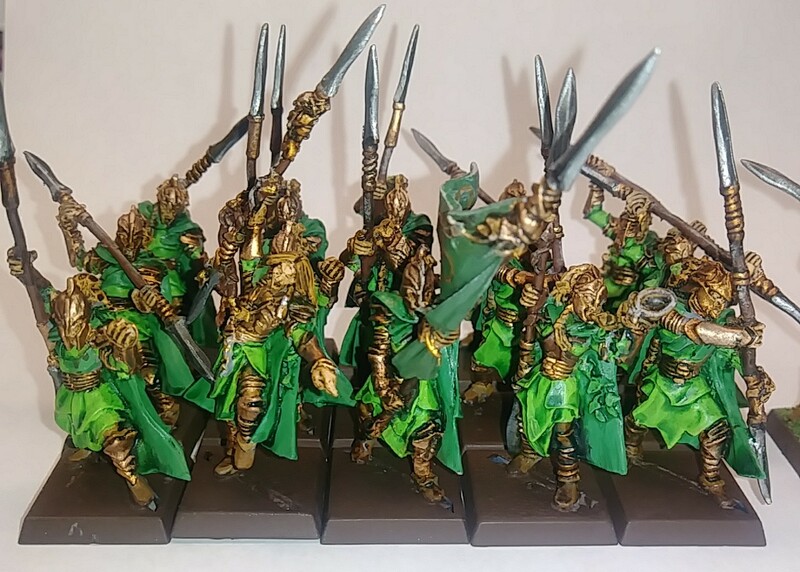 Metal to Finecast - It is mostly a swap of medium. You mean they will be using Ouija boards instead of Tarot cards for their business plans from now on? Yay! First day of spring and mounted crossbows! What more can you ask for! Lovely (if that's the right term) orcs, Shadespyre. I have some of those figures, and it's nice to see them painted by someone else (better).